To know whether evaporative cooling is an effective choice for your facility, it is necessary to have a perspective for the conditions (temperature and relative humidity) likely to exist at your facility and a feel for what are considered acceptable conditions. ASHRAE and the Department of Energy have assembled dry bulb temperatures with coincident wet bulb temperatures and associated time durations for numerous locations in the United States and the world to satisfy this first requirement. This information can be downloaded from their web sites in a convenient and effective format. To answer the second part of this question ASHRAE provides some guidance but only you can define what the acceptable conditions for your facility are. The performance of the evaporative coolers in this ambient temperature environment vary and therefore become another factor to be considered in determining the ability of evaporative coolers to achieve acceptable conditioned space temperatures. AZFlow coolers do not experience a build up of scale and therefore do not experience a drop in performance until several years have past and the rigifying agents are washed from the media and the media begins to lose its ability to maintain its shape. Reasons AZFlow coolers do not experience scale buildup are related to the way the water is metered onto the pad and is this is discussed in more detail in the section Media scaling minimized. Water is metered onto the pads such that an air to wet media is the dominant heat transfer interface rather than an air to water interface. The surface roughness of the wet media surface promotes improved boundary layer turbulence with the consequence of improved heat and mass transfer. The aerodynamic layout of the coolers is structured to improve the heat load distribution and velocity profile across the media such that all the media operates at maximum efficiency. Wet bulb, dew point, and relative humidity are all measures of the moisture content of air and its sensible energy. As the moisture content of the ambient air increases, indicated by a rise in the dew point, wet bulb, and relative humidity, the outlet temperature of all evaporative coolers increases. However, the importance of the amount of temperature increase grows as temperatures get closer to that characterized as the upper limit of comfort. Those with experience of evaporative cooler operations and the Phoenix monsoon season will confirm that Aspen Pad and recirculating coolers are not effective in providing cooling for conditioned spaces during this period. The Phoenix monsoon season, involves a change in the summer weather pattern where desert ground and air is heated to the point where natural convection currents are formed that lift the air into the jet stream causing cool and moist air to be drawn in from the bay of California area which increases the dew point temperature for the Phoenix area. This annual weather pattern lasts for the heart of the summer or from late June to late October. The beginning is marked when the dew point exceeds 55 F for three consecutive days. The corresponding wet bulb temperatures range from the mid 60s to the mid and upper 70s such that aspen pad and recirculating coolers are not able to provide effective cooling. The temperature profile data for the Phoenix, Arizona area is provided in the table below as an example of both the available information and the temperature variation that occurs over the course of a year. As can be seen in the table the number of hours spent at the various dry bulb and coincident wet bulb temperatures during each month and during the course of the year is provided. Given that evaporative cooler outlet temperature can be projected if we know the efficiency of the cooler and the ambient conditions, we can combine the information in the table with the observed cooler performance to project such temperatures for a historical year. We can also use this information to project the temperature of the conditioned space. Effectiveness of wall and ceiling insulation to limit the heat input to the building conditioned air space. Effectiveness of the building exhaust location in supporting application of a displacement cooling scheme by providing exhaust locations that support timely removal of warmer air from the conditioned space without mixing this warm air with the cooler air. Effectiveness of the size of the building exhaust to support application of a displacement cooling scheme by providing exhaust size that support timely removal of warmer air from the conditioned space without forcing a high building back pressure. Effectiveness of the cool air distribution system whereby cool air is distributed from the cooler wet section to floor of the building displacing warmer air while limiting the mixing of warm and cold air. Treating local heat sources to limit their impact on the conditioned space temperature. Addressing the space access to limit the disruption of the displacement cooling scheme. The table below is the full annual temperature profile for Phoenix. Using 75 F as the point of departure for considering temperatures to exceed the desired conditioned space temperature and summing the hours each month the Phoenix dry bulb temperature exceeds 75 F we will confirm that there are 3873 hours each year where this criteria is exceeded. This is reflected in the graph below where the hours requiring cooling each month based on the Phoenix temperature profile form the envelop of an area plot. This not surprisingly shows that the requirements for cooling per month rise rapidly from January peaking in July and August where cooling is required for all but a few hours of these two months. The column plots show projected hours by month where cooling with aspen pad coolers, recirculating coolers, and AZFlow coolers are able to achieve a cooler discharge temperature below the 75 F limit. 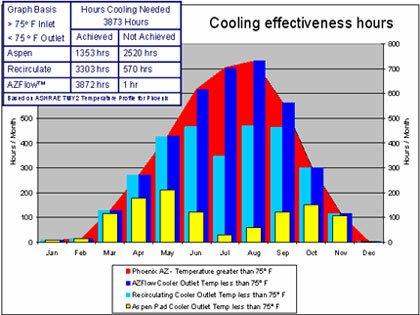 As the graph below shows, Aspen Pad coolers are ineffective for the heart of the summer and recirculating coolers are only able to satisfy this cooling requirement a little more than half the time while the AZFlow cooler is able to satisfy this requirement for all but one hour.